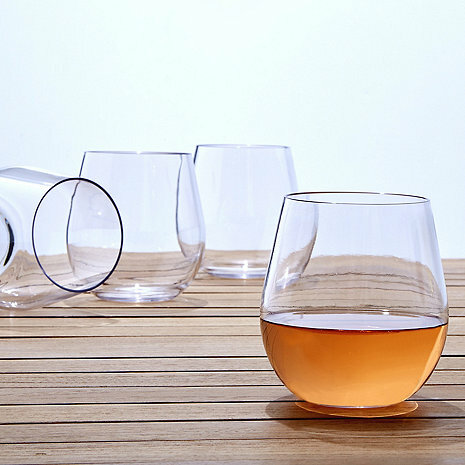 Are the rims thin enough on the tumblers to drink fine wine? How do you compare them to the rim on the stemless wine glasses? BEST ANSWER: The Indoor/Outdoor Wine Tumblers (Set of 8) are made From Food-Safe, Shatter-Resistant Eastman Tritan™ Copolyester (BPA-free/FDA-approved) which makes them practical. The shape and thinness makes them elegant and they are styled to enhance the aroma of the wine. Yes, they are the best we could find. I've tried other plastic glasses and the rim was always too thick. It's not as thin as a high end wine glass but pretty close. Very happy I bought them. Yes, they are. I looked high and low for "presentable" plastic wine glasses for poolside use and these by far are the best in my opinion. These are acrylic so that could affect one's fine wine experience. That said, we have found them fine to use with nice wines. Can I have this personalized with a custom message? BEST ANSWER: They ate fairly sturdy. I would think your best bet wouldbe to go on line and look for custom decals. The personalization is available either with either initial or a logo. Do these glasses have the thumb indention on them? BEST ANSWER: Thank you for your question. These glasses do not have the indentation. Any further questions, please contact us at 800 377 3330. Thank you again. No, they do not have a thumb indentation. BEST ANSWER: The Indoor/Outdoor Wine Tumblers (Set of 8) are manufactured by Wine Enthusiast. I have 3 duraclad small wine glasses that have "shatter" marks. Why? the other 3 are fine. No dishwasher--kept on 43' boat.....?????? BEST ANSWER: The Indoor/Outdoor Wine Tumblers (Set of 8) are specifically designed to endure the elements. I am unsure as to why your duraclad glasses cracked, they might be older glasses and have been in the sun just a little bit too long. I suggest you reach out to the manufacturer for a more specific reason. How big is the bottom and widest area? I want to know if they will fit in my boat's built in drink holders. Thanks! BEST ANSWER: The bottom is about 2 inches and the wides area is 4 inches. How many oz's do these glasses hold? I would like to use them for water glasses. Are these glasses BPA free? BEST ANSWER: Absolutely! They are 100% BPA Free... thanks for your question! Where are the glasses made? BEST ANSWER: Thank you for your question. These glasses are made overseas in Asia. I bought a set of the glasses back in April and they were fantastic. I ordered more in August and very disappointed in the quality. The seams on the glasses are very noticeable. I called customer service to voice my concerns and was told they were not defective, since the glasses are plastic it's the nature of the product. I did state the previous ones did not have the issue and she stated they only thing I could do is return them at my cost. Very disappointed with product since it seems they changed to a lower quality item. This is my second order I have so enjoyed these glasses prefect for deck use and to take by the pool. I bought one set as a gift as my friend loved mine. These glasses appear to be bullet-proof though they are a little big for my hand. Still - perfect for outdoors and the hot tub. Love these wine tumblers. They are perfect for around the pool where no glass is allowed. These are Tritan plastic which is very good quality - ok for top rack, dishwasher. Remain scratch free for a good while although they will scratch eventually. Trim is comfortable to sip from, hand feel also comfortable. Just mind how big they are - the amount pictured is probably 3-4 ounces so don't fill them too high! We gave the glasses to our daughter & son in law for their Anniversary. They have a new pool and needed outside glasses.They love them! Especially good for outdoor use on the patio. We use them outdoors and indoor. Useful all seasons, but edge of glasses craze with repeated washing.